5-inch Tall Gold, Silver or RED Metal Tea School Bell with Black Plastic Handle and Metal Clapper. 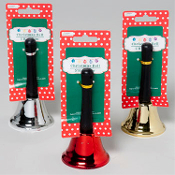 This attention getting bell can be used for multiple purposes, such as school music tone signal, meeting call to order handbell, restaurant store counter help, pet training, summoning aid bell, reception desk, kids play toy handchime. -Signal dinner is ready, train pets, teacher gift, room Mom attention getter, meeting call to order, role playing games, play school, restaurant counter, reception desk, or personal call for aid.